“A hero is just somebody who tries to do the right thing even when it’s hard.” Kamala says these words in this issue, and it’s a brilliant moment that frames Kamala’s character and personality perfectly. G. Willow Wilson takes what could have been a rehashed Marvel plot point (see Inhuman #9) — teens being kidnapped to be used as power sources — and flips our expectation with a twist: these teens are here willingly, because the Inventor convinced them that the best thing they can do with their lives is to be human batteries, instead of merely “parasites” who use up resources. Wilson’s writing has been solid throughout all ten issues of this title, and this issue kicks it up a notch from recent issues. 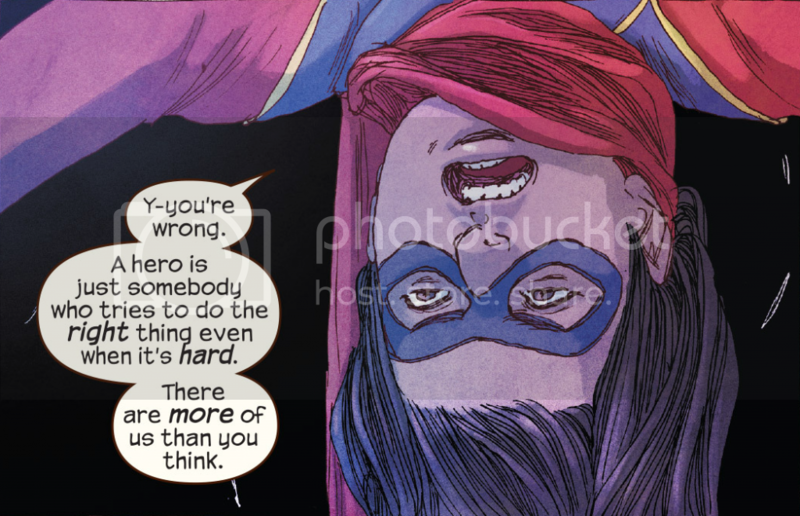 A scene of Kamala discussing with other teens what they are good at is impactful, and also pivotal: Kamala looked up to adults like Wolverine and Peter Parker in past issues, and here she’s the one doling out mature wisdom. Ian Herring’s colors are more matte than the glossy look of most comics I’ve read recently, but it fits Alphona’s scraggly, razor-thinly penciled drawing style. Herring’s use of bright lighting during fight scenes looks great: see the highly contrasting yellow background when Kamala leaps in the air with two fists ready, and when Kamala strikes a punch that leaves the other teens impressed. I also really like the white and kelly green combination Herring uses on several of the Inventor’s robots. 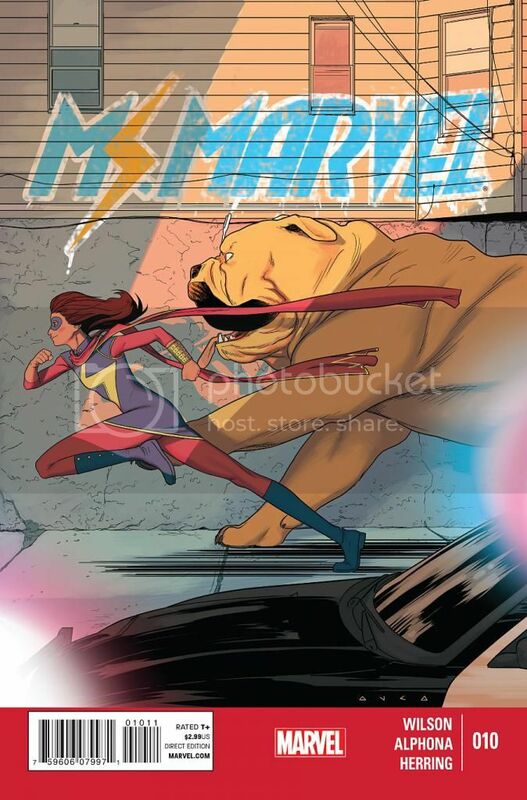 Adrian Alphona draws some fun, elaborate fight scenes, taking full advantage of Kamala’s ability to stretch and embiggen her arms and fists. I like how Alphona always varies the angles we see the action from during fast-paced scenes. This is a stellar artistic team. Wilson has written a rallying cry against the dismissal of the younger generation. Kamala exhibits leadership on a whole new level here, and displays real bravery and heroism. This issue is more gripping, fun, and thought-provoking than recent issues. I’m really liking where Wilson is going.